"Rhythm is what makes a good Afrobeat record," says Gabriel Roth, Daptone Records co-founder, producer and connoisseur of all things funky. "Not just the rhythm section, but the rhythm of the horns, the rhythm of the vocals, the rhythm of the keyboards, everybody's rhythm. It's not just being about being right or wrong in your rhythm, or being good at it, but it's about feeling something the same way, swinging the same way, anticipating things the same way, and hitting things the same way - everybody hearing music the same way, and being able to turn all those instruments into one voice. "Antibalas is the only band that can do that, right now. That's why they're still at the front of the scene, after all these years." Fourteen years after their first gig, and five since the release of their last album, 2007's Security, Antibalas - Afrobeat's premier second-wave ensemble - are back with their fifth full-length release. 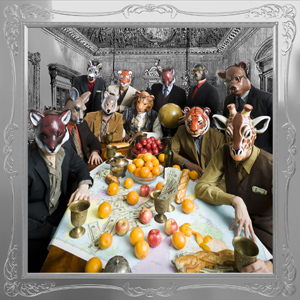 Simply titled Antibalas, the album is both a blazing reaffirmation of the NYC band's collective musical strengths, and a hard-hitting continuation of their funkified excursions into what Antibalas founder and baritone saxophonist Martn Perna calls "our vault of esoteric sounds and knowledge." "We kicked around a couple of different titles," Perna explains, "but we could all agree on Antibalas. We're always who we have been, and this is what we are and what we're about, without any frills. If you've never heard any of our albums before, this is the one to listen to." "Musically, it's our best playing as a band," says trumpeter Jordan McLean. "We're having more fun together, we're all breathing in sync, the structures of the compositions and the overall sound are tighter, and the band is sounding better than ever." Recorded over a two-week period at Daptone's House of Soul Studios in Brooklyn with Roth at the helm, Antibalas is the first Antibalas full-length to be released on Daptone, which - given Antibalas' deep- and long-running ties to the label - brings things kind of full-circle for the band. Antibalas has shared past and present members with several outfits in the Daptone stable (such as Sharon Jones & the Dap-Kings, Menahan Street Band and The Budos Band), while Roth was an original member of the band, and produced the first three Antibalas albums. "Making this record was like going back and playing basketball with all your high school buddies, or something," says Roth. The "family reunion" feeling on Antibalas is further bolstered by the return of original guitarist Luke O'Malley, who contributed "Dirty Money," the album's effervescent opening track. "Luke O'Malley has an amazing sense of music," says tenor saxophonist Stuart Bogie, "and 'Dirty Money' is a perfect example of that. But he's also such a hilarious and inspiring person, who leads with just kind of a blind energy into everything he does. He's very much a reason why everyone in that room is there." "We've woven ourselves together musically, but also personally," says Perna. "It's a community that has existed as Antibalas for 14 years now, and if you go back to when Gabe and Luke and I started making music together, it goes back to '94." According to Perna, a little-known but tasty morsel of music trivia is the fact that TV on the Radio, The Dap-Kings and Antibalas all began in the same apartment - a decrepit old factory loft at 132 Havemeyer Street in Williamsburg. "Gabe, Tunde Adebimpe and I were all living there at the time Antibalas was getting started. The Dap-Kings were called the Soul Providers at the time; that was just getting off the ground. Tunde just finished at NYU and was doing animation stuff at the time, and we would mess around on the cassette four-track and make little songs. And then Dave Sitek moved into the loft, and he and Tunde started making music. So this little liminal space was so fertile with friendship and creative imagination, and this shared sense of struggle that was manifested in three musical groups that have made a pretty strong impact on America in different ways." Originally conceived by Perna as a cross between the NYC Latin funk grooves of Eddie Palmieri, Harvey Averne and Mandrill and the Afrobeat jams of the late Fela Kuti, the music of Antibalas gradually shifted towards the Fela side of the equation. "As we got deeper into Afrobeat, we realized that we were juggling a lot of things, and kind of need to have only one thing on our plate," Perna recounts. "At the time, there was not a lot of interest in Afrobeat, or in Fela, per se," adds Roth. "Because of that, a lot of people looked at Antibalas as pioneers in this second wave of Afrobeat that kind of blossomed around the world. There are great Afrobeat bands now in Brazil, in Chicago, in England, in a lot of places, and I think a lot of those bands looked to Antibalas, alongside Fela, as one of their real inspirations." Through their concerts, tours and recordings, Antibalas have helped re-popularize the classic Afrobeat sound, in the process earning the admiration of a wide array of respected musicians, including everyone from Questlove and David Byrne to Fugazi's Ian MacKaye and John Frusciante of the Red Hot Chili Peppers. Much in demand as collaborators, they've performed as a band in the studio and on stage with such artists as Medeski Martin & Wood, The Roots, Public Enemy, Paul Simon, Amadou and Mariam, and Fela's son Femi Kuti, to name a few. In 2007, following the release of the band's last album, Security, Antibalas' Afrobeat expertise led to the involvement of several band members - including trombonist Aaron Johnson and Jordan McLean, who respectively served as Musical Director and Assistant Musical Director - in Fela!, Bill T. Jones' musical based on the life of Fela Kuti, which eventually went on to a successful Broadway run, earning eleven Tony Award nominations and three wins. But Fela! wasn't the only thing keeping Antibalas busy between Security and sessions for the new album; in addition to playing about 50 shows a year across the globe as Antibalas, the band's members have individually recorded and/or performed with TV on the Radio, Iron and Wine, Amy Winehouse, Mark Ronson, Sharon Jones & the Dap-Kings, The Roots, Angelique Kidjo (whose 2007 album Djin Djin earned the Antibalas Horns a Grammy Award), Ornette Coleman, David Byrne, Miike Snow, St. Vincent, Gomez, Wale, Spoon, The Black Keys, Imogen Heap, Lee Fields, Melvin Gibbs, Sugar Minott, Patti Smith, Sierra Leone's Refugee All Stars, and The Budos Band, as well as devoted ample time to their (and each other's) side projects like Ocote Soul Sounds, Superhuman Happiness, Piano Music & Song Trio, Chico Mann, and Fu-Arkist-Ra. "During these past five years, with all the side projects, it was still all of us playing together, just not in Antibalas," Perna explains. "We were all still locking in together, building friendships, building the musical trust, and building the sort of ESP that happens when musicians play together for a long time. It wasn't like, 'See you in five years!' We're not reuniting per se, because we were never disunited; we were just all busy with other hustles." That heightened musical ESP is deliciously tangible on Antibalas, much of which was recorded live in the studio to one-inch 8-track tape. "There's very little in the way of overdubs," reveals Roth. "A little bit of background vocals, maybe a punch here on a solo or a guitar part, but for the most part it was live. I'd done the early Antibalas records on 16-track, but this record I did on 8-track, which I was able to do because the band is playing better than ever. I could mix people together, and not worry about how I was going to take 'em apart and fix 'em later, because these guys are the baddest in the business, and they were swinging from the beginning." Tracks like "The Rat Catcher," "Him Belly No Go Sweet," "Ari Degbe" and "Ibeji" capture the band's fiery telepathy and unrelenting sense of groove, while also showcasing their most concisely focused attack yet. From the deft rumble of the new rhythm section (drummer Miles Arntzen and bassist Nikhil Yerawadekar) to the leonine growl of longtime frontman Amayo, the band - which also includes Victor Axelrod (organ, electric piano, sticks), Marcos Garca (guitar, background vocals) and Marcus Farrar (shekere, sticks, background vocals) - sounds more locked in and self-assured than ever. "What makes us tick, and what makes any band a band, is a shared collective idea about what the sound is," says McLean, "and then of course on an individual level, it's what each person brings to the band to give the band its defining sound. We have a shared idea of Afrobeat and Fela's music, but we also have these 10 or 12 individuals who are also bringing their own heartbeat and their own perspective and their own experiences as individuals, and bringing that together to make Antibalas." "We love this Afrobeat, it's important to us, it's not appreciated enough - and making it is a transformative process in so many different ways," says Perna. "Unlike most music that's really ego-driven and centered around one person or cult of personality, all of us have had to learn to function with really specified roles - everyone becomes a drummer, in a certain sense. Our parts may be played on melodic instruments, but they're part of this huge interlocking net that holds up the music." "What's interesting about Antibalas is that it really is a multi-headed beast," adds Bogie. "The last song on the album is 'Sare Kon Kon,' and it's a song that has a kinetic energy that's just racing and racing the whole time. To paraphrase the lyrics, it's like, 'We're running, we're running, we don't know where we're going, but everybody's running.' That kind of encapsulates the rushing anarchy that keeps the band together. It's the idea that we're all kind of on this train, and there's no director, no engineer, no brake; everybody just has to run, and go or not go. "It's kind of mysterious," he continues. "Antibalas is really a band that is bigger than any of its members. I believe that it is one of the most genuine anarchies that I have ever seen in a band. I think that's what's most interesting and different about the band. But I think it's the essence of the music, and our love for it, that really brings us together."